← What Colors Go With Gray? Oh I can’t help playing around in the Sherwin Williams ColorSnap app! I wish painting was this easy. Well at least you can get some idea of what your room will look like. Here I have Restful SW 6458 and it’s a great choice for just about any room of the home. One of the reasons I really like this color is because of all the other colors you can use in your home to build off of it – and there is not one stitch of blue or gray. You of course can incorporate those colors but I’m just trying to show you that you have other options. Look at Moonraker SW 6701. That is one nice yellow. Not too beige not and not anywhere near a gold. Not that gold is bad but I know a lot of people are afraid of the “G” word – gold. I’m actually not a fan of Extra White SW 7006, I should have changed that to something less white but it’s ok for now. So look at Serria Redwood SW 7598. That would be a nice color for an office or dining room and it plays off the Restful so nicely! Green and brown look gorgeous together as well. Have dark wood flooring? Green walls would be perfect! So tell me, will you go green? 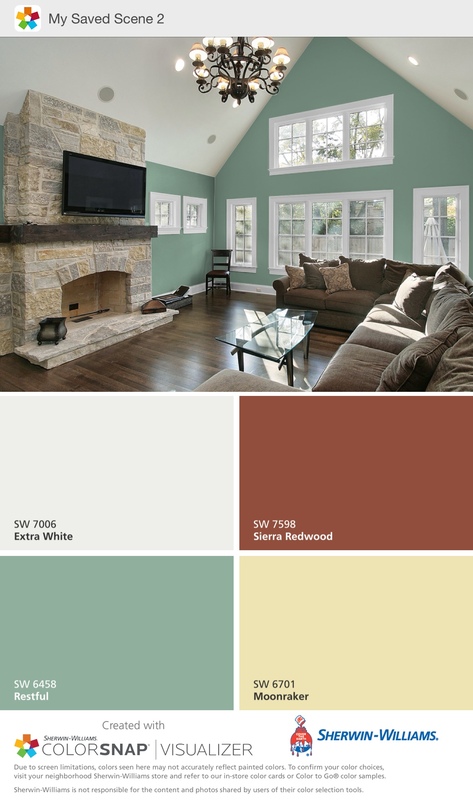 This entry was posted in Color, Sherwin Williams and tagged green, living room, Restfull SW 6458, Sherwin Williams. Bookmark the permalink.